Don't settle for a small or lighter gel pack. 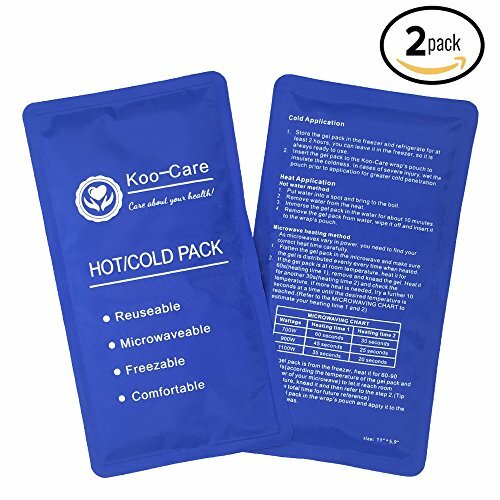 Grab Koo-Care large all-in-one ice pack set for heat & cold therapy! What's the characteristic of these gel packs? ✓ CE and FDA certificated. ✓Best customer service. Please get in touch with us for any questions. What makes Koo-Care Ice pack distinctive from the other brands? ● Quality material - Nylon material, no smell and feel of plastic. ● Size & weight -This medium size gel pack is larger than competing items and filled with enough amount(1.1 lbs) of gel. Some other brands just fill 0.5 lb gel in the pack which will not keep cold long. ● Hot and cold- It is more useful than some single cold pack. without considering the different power. "Add Both To Cart " or the super link under Special Offers and Product Promotions column. Durable & Efficient - Includes 2 medium size gel ice packs(11" × 5.9", 1.1 lbs×2). Crafted from nylon composite, the gel pack is soft to touch and more durable than the vinyl pack. It is also larger and heavier than similar competing products, so It keeps cold longer than them. Non-toxic & Flexible - The gel inside is non-toxic, the gel pack is CE and FDA approved. It keeps flexible and soft after frozen even at 0 °F (-17℃), so it is easy to wrap around all body parts. Multipurpose - The gel pack is reusable and can be frozen, heated or microwaved, available for both heat and cold compress. It is perfect for shoulder, arm, back, belly, thigh, knee, shin, ankle etc. Essential - First aid essential for household or clinical use as it is ideal for sports injuries, muscle pains, strain & stiffness, body aches and more! Keep one set in your freezer for grab-and-go comfort from pain. Get the soothing relief from hot or cold therapy right away. Guaranteed: 1-Year Warranty - a Free No-Hassle Replacement Process!